A veterinary technician and teacher of conservation education programs in her home state of New Jersey, Corinne (Lackner) Stephens’ passion for animals and her community played a role in her everyday life. In 2005, Corinne decided that she would further combine her interests by pursuing a Master of Science in Animals and Public Policy (MAPP) at Cummings School of Veterinary Medicine at Tufts University. 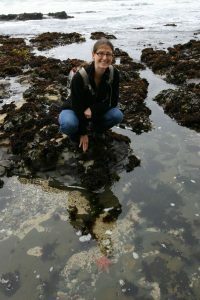 Her externship with the Massachusetts Division of Fisheries and Wildlife to document the exact locations and risk factors involved in turtle road mortality would lead her to join Defenders of Wildlife in Washington, DC upon graduation, followed by an eight-year stint with the Wildlife Habitat Council. 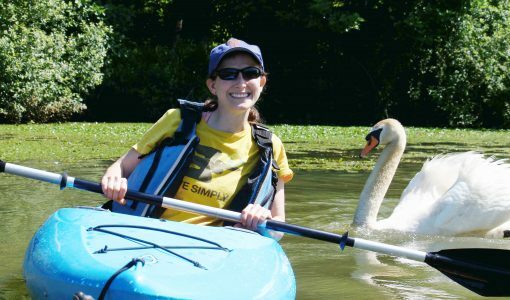 Living, working, volunteering, and kayaking in the Chesapeake Bay watershed’s ecosystems, rivers, and streams, Corinne had a strong desire to stay local and help to protect the native wildlife and environment in her backyard. Below, find out how her education and experience allowed her to do just that. With help from the MAPP program, Corrine was able to pursue her dreams of living, working, volunteering, and kayaking in the Chesapeake Bay watershed’s ecosystems, rivers, and streams. What is your current profession and where do you work? I currently work for the Alliance for the Chesapeake Bay as the business partnerships manager. I created and now manage the Businesses for the Bay program, which encourages businesses to take voluntary and measurable actions to support protection and restoration of our local waterways and help the public understand the valuable role of the business community in sustaining the health of the Chesapeake Bay and its watershed. I am also on the Board of the Friends of Sligo Creek (our local watershed group) and will become the president in January. What projects have you completed in the past year? In the past year, I am thrilled to say that I have designed and implemented the Alliance’s new Businesses for the Bay program. I have worked with our Steering Committee of business leaders throughout our watershed, designed the membership association requirements, acknowledged our new members and partners, worked with a web designer on our new website, learned how to use WordPress to update the website on my own, and organized and run multiple Chesapeake Business Forums throughout the Chesapeake Bay watershed. Through this program, I have spoken with hundreds of business, government, and non-profit representatives. It’s so exciting to see such a diverse group of people sitting around the same table with the same goal: to help restore and protect our beloved habitats, rivers, and streams. Corinne’s final research project with the MAPP program involved picking up deceased turtles that had been hit by cars and bringing them to the wildlife clinic to help extract their eggs to put incubators. 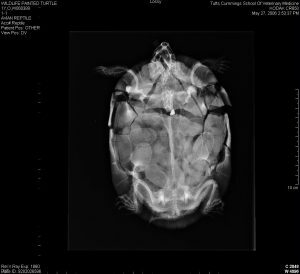 My favorite memory of the MAPP program was my final research project, which involved picking up deceased turtles that had been hit by cars, bringing them to the wildlife clinic, and working with Dr. Murray to extract their eggs and put them in incubators. What is the most important thing you learned during your time in the MAPP program? I can’t think of just one thing. I learned so much about myself as well as biology and policy! 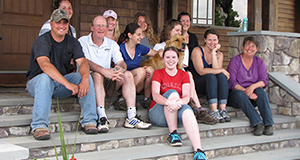 I started the MAPP program with a love of wildlife, but a background in environmental education and domestic animals. In just 12 months, through my classes as well as my volunteer experience at the Tufts Wildlife Clinic, I gained a better appreciation for what I truly wanted to do with my career. I knew I wanted to work for a non-profit when I graduated, and I knew animals would be involved in some way, but I never thought that 10 years after graduating I’d be managing a program that brings together business, government, and non-profit representatives to ultimately protect and restore habitats and the environment. I think MAPP gave me the opportunity to branch out, learn new things, learn how to talk with people who view the world differently than I, and see all the different ways I could positively impact wildlife. As much as I disliked it at the time, practicing grant writing with Dr. Rutberg truly prepared me for real life at a non-profit! That is a skill I’ll continue to use! Get out into your field (mine was wildlife) and volunteer or do an internship with a credible organization to help gain some in-the-field experience. I interned with Defenders of Wildlife in Washington, DC for six months, working on federal lands protection issues. I then worked with Wildlife Habitat Council for eight years, managing their certification department and team. Why do you think you’ve been successful? I think MAPP gave me so many ideas to work with by expanding my horizons and showing me there are multiple ways to make a difference. Through MAPP, I was able to determine that I wanted to focus on wildlife, which led me to my internship and eventually my full-time jobs. I think learning about all the aspects of animal policy was important for me to be able to trust myself to narrow down what I wanted to do for my career. Also, I can say that volunteering, in addition to your day job, can be very rewarding. When I am not working, I am measuring water quality by collecting and identifying macroinvertebrates in a local stream. I also joined my local volunteer-led watershed group, the Friends of Sligo Creek, when I first moved to Maryland. I have met so many great people and mentors through this volunteer group, and was elected to the Board of Directors about three years ago. I was recently elected to be the President of Friends of Sligo Creek, which was an honor, to say the least. What has been the most rewarding experience in your current job? In my current job, it is so rewarding to watch business and environmental non-profit representatives networking in the same room, with the same common goal. Also, I love visiting business-owned land and seeing all the great things the different office green teams can accomplish, including native pollinator gardens, rain gardens, permeable pavement to reduce storm water runoff, newly planted trees, songbird nest boxes, and environmental education activities designed for neighborhood school groups. Businesses, as well as all landowners truly can make a difference, so I am thrilled and honored to be in my position raising awareness about just that!